On September 14, 1990, Ashanti DeSilva became the first of only two participants in the world's first approved gene therapy trial. The experimental setup of the trial as well as the interpretation of the results have been subject to considerable criticism, but despite its flaws, this trial showed that gene therapy can be done. 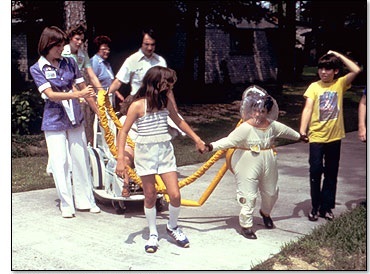 Most of us are familiar with the fate of David Vetter, the so-called bubble boy. David suffered from the X-linked form of the severe combined immunodeficiency (SCID). The X-SCID variant is defined by mutations in the gene of the common gamma chain (γc) protein, which is part of various interleukin receptors. The consequent defects in interleukin signaling result in the near-complete absence of T and NK cells as well as the complete lack of B cell function. Thus being almost completely defenseless against any kind of infectious agent, David lived his entire life in a sterile plastic chamber without human touch. He died at the age of twelve, a few months after receiving a bone marrow transplant from his sister. The transplant was contaminated with dormant Epstein-Barr virus and David's still undeveloped immune system was unable to cope with the infection and the resulting lymphoma. Although screening methods and transplantation techniques have improved and deadly outcomes of the SCID treatment have become rarer, the dependence on matching donors and the - still substantial - risks are major drawbacks of bone marrow transplants. Gene therapy was the proposed answer to all these difficulties. Graft versus host disease is avoided by simply transfecting the patient's own cells with the missing gene. The selective advantage conferred to the transfected hematopoietic progenitor cells should ideally result in a stable and healthy immune cell population. Ashanti DeSilva, born in 1986, was 26-months-old when she was diagnosed with SCID after being afflicted by an almost ceaseless series of infections. She suffered from adenosine deaminase (ADA) deficiency, a rarer and slightly less severe form of SCID compared to David Vetter's X-linked SCID variant. W. French Anderson, M.D. and R. Michael Blaese, M.D. began working on a retroviral approach to gene therapy for ADA-SCID in 1985. Their technique of isolating and transfecting T cells using an LNL6 retroviral vector was finally approved by the NIH's Recombinant DNA Advisory Committee and the FDA in July and September 1990, respectively. The then four-year-old Ashanti DeSilva became the first to receive this treatment. Four months later, the nine year old Cynthia Cutshall followed. As a safety precaution, additional ADA was injected weekly which might have contributed to the only transient success of the gene therapy. Having no selective advantage, the small number of transfected T cells were unable to form a stable population and died. However, the patients exhibited no noteworthy side effects and grew up normally into adulthood. In that sense, the trial was a success even though it was far from a cure. From this memorable day and onward, gene therapy has become an ever-growing field of medical research. Despite some serious setbacks, most notably cases of leukemia after X-SCID gene therapy and the more recent deaths of some patients following gene therapy against Wiskott–Aldrich syndrome, many other trials have been successful and have led to therapies for previously incurable diseases. David Vetter on one of his few trips outside of his bubble (Baylor College of Medicine Photo Archives).